GOOGLE MAPS STARTING POINT: Auronzo refuge. This is one of the most famous – and fascinating – “Vie Ferrate” in the Sesto Group of Dolomites. 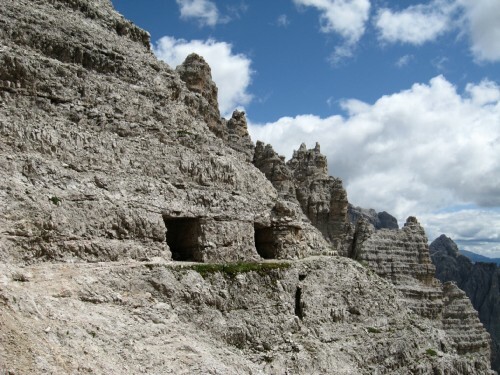 It combines fantastic views to the Tre Cime di Lavaredo and an interesting wartime path with an extensive tunneled section and ruins of wartime trenches. We suggest you to start this itinerary as early as possible in the morning because the “Via Ferrata De Luca - Innerkofler” is usually crowded with tourists in high season. The whole tour takes about 5 hours; you should therefore plan a short break at Forcella Camoscio and then eat on the way back at Refuges Lavaredo or Pian de Cengia. The itinerary should be undertaken only in good weather; it pays to check local weather forecasts before leaving. Degree of difficulty: Medium to advanced (good physical shape and basic climbing experience), only with proper equipment (a complete trekking and climbing equipment) and a torch. Drive to Auronzo Refuge with your own car (toll road of about 20 Euro for the last 7 kms). You can go on foot from the parking at the beginning of the toll road, but it takes more than 1 hour. A shuttle bus is usually available during the summer months from Misurina. Please check this last - and cheapest! - possibility, contacting the Tourist Office of Misurina, Email. As you arrive to Auronzo Refuge, take the path n. 101, which leads you to Forcella Lavaredo and to Lavaredo Refuge and go on towards Locatelli Refuge. The path runs along the rock face of Monte Paterno and reaches the Forcella Toblin (m.2405) where the Via Ferrata starts on the right. Climbing on the old wartime path and turning around a pillar called “Salsiccia di Francoforte”, you reach quickly the first tunnel entrance. Headlamp and an extra pullover are suitable, because the cold-wet tunnel climbs steeply and it's quite dark. Take your time to explore the tunnels, especially the second stretch, with its side-tunnels, windows and lookouts, rooms and rests of wooden barricades. At the end of the tunnel you arrive into a small platform, where you can wear the special equipment for the climbing (lanyard, energy absorbers, helmet and harness) and start climbing towards the Forcella Camoscio (m.2650). This passage is quite easy for trained climbers, should not be anyway underestimated (sometimes you have to pay attention to rubble and snow). From the Forcella Camoscio you have three options. 1) You can go up to the summit of Monte Paterno (m.2744) through the “Via Ferrata” on the right and then descend with one of the following alternatives; 2) You can descend immediately towards Forcella Passaporto and Forcella Lavaredo, taking a fascinating (wartime dugouts and fortifications), but difficult route. This option requires a good climbing experience; 3) We suggest you to take a third alternative, the “Sentiero delle Forcelle”. It may be longer but is equally attractive. This path runs along the eastern crest of Monte Paterno, scene of tragic war acts during WWI. You can still see the evidence of it by walking through ledges connected with wood bridges and ladders, till you reach “Forcella dei Laghi” (m.2550). The landscape you can enjoy is simply great. From here, you have to walk down to the path at the base. At the junction of path n.101 and path n.104, you can choose if you want to take a break and eat at the near-located Pian de Cengia Refuge (path n.101) or at Lavaredo Refuge (path n.104). It depends on how hungry you are! In any case you have to go back to Lavaredo Refuge in order to reach the starting point at Auronzo Refuge.